The psychology behind trading stocks is the force that moves the stock market. A stock chart is nothing more than a picture of human emotions. Painted on the canvas are the emotions of greed, fear, hope, and euphoria. As a disciplined trader, you capitalize on the psychological demons that plague other traders. Should I take a loss? These are some of the questions that destroy trading accounts because the novice traders asking these questions do not have a plan. If you asked a professional trader one of these questions he or she would say, "I don't know. What does your plan tell you to do." So what ends up happening? They get excited and buy at the worst possible time. Then the stock reverses. Fear creeps in and then the stock goes lower... and lower... and lower. Finally the pain becomes too much to bear so they sell taking a huge loss. You cannot take big losses and expect to be a profitable swing trader and if you cannot take a small loss, then you will take the mother of all losses! Believe it! Excitement! Euphoria! Yeah, I'm making money! "I had better sell to lock in these profits since I have had several losing trades in a row." The trader then ends up selling too soon! By now I'm sure that you have heard the saying, "Keep you losses small and let your winners run". Look at what just happened in the above example. The un-disciplined trader has just done the opposite! They have let their losses get big and they have limited their winners! All of this mental anguish can be eliminated by having a decent trading strategy and the mental discipline to stick with it. Write down a plan for the trade before you trade the stock. Then trade it according to the plan that you have written. Remember that you have devised a plan before you got into the trade when your emotions were stable. Now you can trade your plan with confidence. For most novice traders, it is not their strategy that is causing them to lose money. It is themselves that is their biggest enemy. Breakout Traders - These traders bought the breakout. They operate under the "greater fool theory". They are just praying that other traders come along and buy higher than they did. Novice Traders - These traders just have no idea what they are doing. 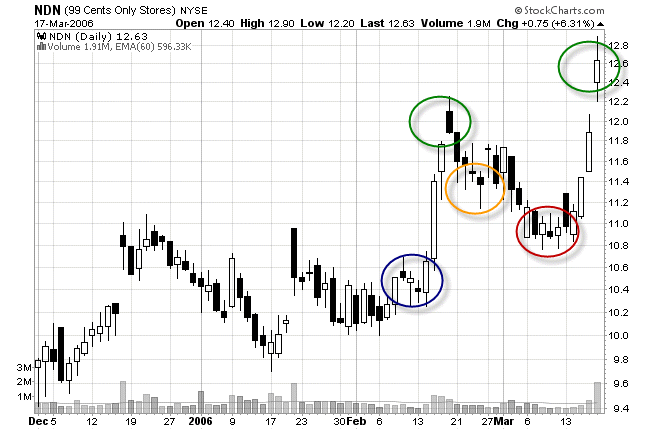 There are buying shares of stock that the breakout traders are now selling to them. Momentum Traders - These traders are buying the pullback and tend to buy near the 10 MA. They are likely going to put their stop below the low of the hammer. Swing Traders - This is where we come in. The stock falls below that hammer and the momentum traders get stopped out. By now most of the novice traders and momentum traders have sold. See how the volume has tapered off? Previous resistance now becomes support. Novice Traders - Once again, the novice traders are buying at the worst possible time. We need these traders so that we can sell our shares to them and make a profit. This happens over, and over, and over again - on every stock chart in every time frame. Remember this is all just speculation. We obviously aren't mind readers - but we can understand how other traders think. How do I know all this? Because I used to be a breakout trader... and I used to be a novice trader... and I used to be a momentum trader! So I have a general idea of how they think, where their stops are, and what they might do next. As swing traders, all we really have to know is the psychology behind the moves in the stock market. We have to learn how to control our own emotions first and then we have to learn how to profit off of those that have not learned how to control them!